A local pharmacy provides a convenient location to access a health professional who can assist with smoking cessation. The community pharmacist is familiar with the drug therapy needs of their patients and they provide information to the public on all areas of wellness and chronic disease management. 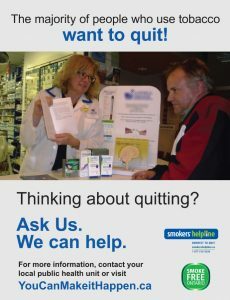 Pharmacists support patients who want to quit smoking by adding to the choice of options for counselling, by providing quit smoking materials and by improving access to smoking cessation medications. In 2012/2013, a total of 31,958 Ontario Drug Benefit Program patients received smoking cessation medication – such as Zyban ™ and Champix ™ or counselling at a community pharmacy, the highest reach of any Ministry of Health and Long-term Care funded program. There are multiple competing priorities facing Ontario pharmacies. In order to gain leadership/ownership support for the integration of tobacco dependence interventions into pharmacy practices it is important to incorporate evidence into your planning tools and discussions with decision makers. There are evidence-based program examples and tools which already exist to help you move your project forward. These programs include a variety of frameworks, models, templates, tools, billing information and resources to help you plan, implement and evaluate your program. Contact the programs directly for more information or resources. Ensure that medications are taken as prescribed. There is no cost to the patient. For eligible patients may contact their pharmacists if they require another MedsCheck during the year for reasons including a planned hospital admission or managing their medications after being discharged from the hospital. The MedsCheck program includes questions which assess patient tobacco use. Community pharmacists are funded by the Ontario Government to provide smoking cessation for Ontario Drug Benefit (ODB) recipients (Sept 2011). Aligns with other smoking cessation programs in primary health care and community settings to provide smokers with a continuum of care. Improves access to and choice of stop smoking services, including advice on smoking cessation options, support tools, resources and follow-up. Provides patients with a consistent, evidence-based standard of care based on a screening mechanism, cessation counselling, structured documentation and support. Follow-up counselling sessions over a one-year period. The pharmacist can recommend and prescribe appropriate stop smoking drugs and aids and dispense either Champix or Zyban to ODB recipients. Readiness assessment, patient consent form, first consultation meeting, quit plan, primary follow-up sessions 1-3, secondary follow-up sessions 4-7 and the program evaluation. Patient documentation form for the Ontario Government’s funded QUIT Smoking Program. The CPhA has created an interactive documentation format which incorporates and expands on the MOHLTC’s standardized documentation templates which are required to meet the standards of care and to maintain program consistency. The form can be completed manually or electronically. The document supplements the CPhA’s evidence based, comprehensive continuing education CCCEP-accredited online QUIT (Quit Using and Inhaling Tobacco) training program. In order to be eligible to receive funding for provision of the Ministry of Health and Long-Term Care’s (MOHLTC) pharmacy-based smoking cessation program for Ontario Drug Benefit recipients pharmacists are required to complete a smoking cessation training program.The training will provide you with valuable information on the rationale for doing tobacco cessation in the pharmacy setting; how to set up a smoking cessation program in your pharmacy including how to use the documentation/patient assessment tools; and how to implement the program in your pharmacy including patient screening, enrollment, appointments and pharmacotherapy tips. You will receive as a part of this training a toolkit which includes helpful patient assessment and pharmacotherapy tools. This toolkit provides practical information on screening, assessing and managing patients who are trying to quit smoking. 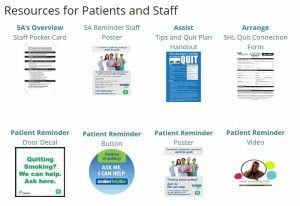 It includes patient assessment tools, information on pharmacotherapies (NRT and prescription meds), links to other professional resources, including best practice guides and patient information materials and self-help resources. 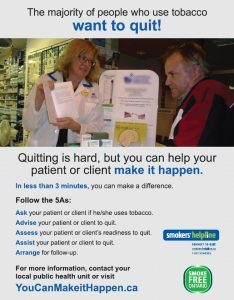 Pharmacists are considered a credible source of information by patients – you can help your patients to quit smoking, even with just a few minutes of your time. Tools and resources (English and French) for practice available to all graduations (both live and online). Provides an overview of concepts and best-practice approaches currently used in the management of smoking cessation by healthcare professionals. A pharmacist toolkit is available in the member section of OPA’s website. The Canadian Council on Continuing Education in Pharmacy has accredited this program for up to 6 CEUs (CCCEP File #1044-2011-221-L-P). Accredited by the Ontario College of Pharmacists for 40.5 credits. Knowledge translation project offering Canada’s only internationally-accredited certificate program in cessation counselling (Herie et al., 2011; ATTUD). In order to complete the TEACH Certificate Program, students must complete the online, pre-requisite OTRU course, the three-day core course, one specialty course, and all pre- and post-learning assessments. Ontario Tobacco Research Unit, Smoke-free Monitoring Report.